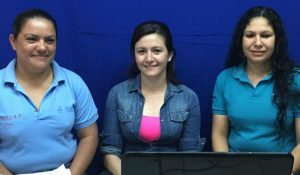 Last week, Karla Vargas, Margie Zepeda and Xenia Castellano, all PWW Health Promoters in Honduras, took to the airwaves, sharing on both radio and TV about Menstrual Hygiene Day (May 28th), and PWW’s work to provide education about safely managing menstruation to girls, families and teachers. We asked Xenia to share the experience. “To go on radio and television was a marvelous experience. We already have the opportunity to go to individual communities and families in Trojes, but, through the radio and TV, we can reach so many more people in the El Paraíso department of Honduras. We began the interview by explaining what Menstrual Hygiene Day is all about. We spoke about the importance of menstruation all around the world and the consequences of poor hygiene practices associated with this monthly cycle. We shared the details about the fair we are organizing in Trojes for Menstrual Hygiene Day, May 28th, and the work we are doing in communities. We even explained how to make a reusable menstrual pad. The interviewer at the radio told us that a lot of women ask him questions about menstruation issues during his programs, but that he never has known how to answer. So, he was really grateful to learn about this subject, so that the next time he is asked, he can help. After the radio show, I went to a Community Agent meeting in a small community three hours away from where we had completed the interviews. All of the women were anxiously waiting for me. They had all been listening to the program. They really liked that we spoke about this subject, as no one had ever educated them. They wanted to know even more. Learn more about Menstrual Hygiene Day…a special day dedicated to breaking the silence about the menstrual cycle and building awareness, by clicking here. *Please indicate that the donation is for menstrual hygiene in Honduras.